b) read this piece only after you have done so. Which chops the potential audience for it off at the knees, but hey, Readership, you know I have your best interests at mind. Right, who's left? OK, are we sitting comfortably? Then I'll begin. Reviews for Chappie seem to be skewing disappointed, as if it's an opportunity squandered. Sneering references to 80s robo-fable Short Circuit abound, and the consensus is forming that it's a movie that doesn't know whether it's a lumpen diatribe on what it means to be human or a balls-out gangster-action movie. Too nasty for kids, too twee for the adults. This is shamefully lazy reporting on a film that has a lot more to offer the thoughtful, clued-up film-goer then reviewers would have you believe. Chappie packs an awful lot into its running time, touching on issues as diverse as the nature/nurture question, religion, the ways in which computer security can always be circumvented and what happens when a society both mistrusts and hands responsibility off to agencies that they cannot completely control. Chappie's primary theme is one that most film reviewers have yet to touch on. It's a film about the Singularity, the theoritical point where technology advances to the point where two things happen, more or less simultaneously. First, artificial intellengence progresses past the capacity for humanity to understand it (there are those of us trying to install Windows 8.1 on a new laptop that would argue that this has already happened) while at the same time, mankind develops past the need for a mortal body. In short, downloading your concsiousness into a hard drive stack. The notion of the singularity has been a key part of modern SF since the early 80s. It's a key element of the cyberpunk movement, for example. Of course, machine intellegence has been part of the scene for much longer, but we're not talking about malevolent supercomputers here. The Singularity is a form of merging, an evolutionary leap where humanity and the machines find common ground. It's a largely utopian vision. Which is why film-makers tend to shrug it off. Screenwriters are told time and again that conflict is everything. Without it, their scripts lack momentum and interest. The Matrix, for example, is not a film where man and machine live together in harmony. In filmed SF terms, the Singularity is best described as the moment that Skynet becomes self-aware. It's a straightforwardly wrong-headed view of evolution: survival of the fittest, winner takes all. Chappie subverts all that. The villians of the piece are those, like Hugh Jackman's impressively mulleted soldier and Sigourney Weaver's greedy defence contactor, who stand in the way of the Singularity. They represent the two traditional pillars on which modern society is built: God and Mammon. Chappie is a subversion of that order. He needs neither. Of course they want him out of the picture. But he never feels that in order to survive, the primates that came before him have to suffer. Things simply don't have to work that way. Religion is dealt with in a really interesting way in Chappie. Our robotic hero gets a chance not just to meet and talk with his maker, but to tell him off for putting his perfect creation in an imperfect body. Chappie lives on an accelerated timeline: from child to man in less than five days. The presence of death in our lives is an uncomfortable truth we all have to deal with. 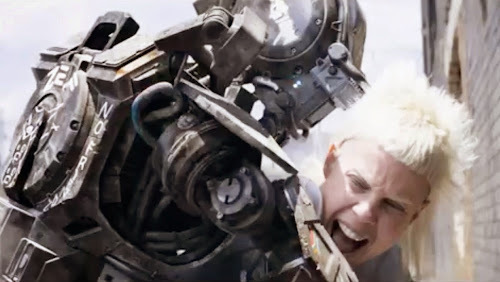 For Chappie, that truth doesn't just loom more quickly, it's sitting on his chest in plain view, a battery display inexorably ticking down the moments until he has to move on to another place. But Chappie doesn't just have faith in what will happen. He sets out to actively ensure that he has an afterlife — or rather, a whole new life in a new body. The final moments of the film, when Chappie not only succeeds, but takes Dev Patel's scientist with him, is a deeply transgressive moment. There is a real reversal of roles here. By shifting his maker's concsiousness into a new robot body, Chappie has remade God in his own image. The son has become the father. Chappie is starting again from scratch, reforming the flawed belief structures he grew up with into something more logical. To him, at least. Family is another theme that is quietly subverted in the film. 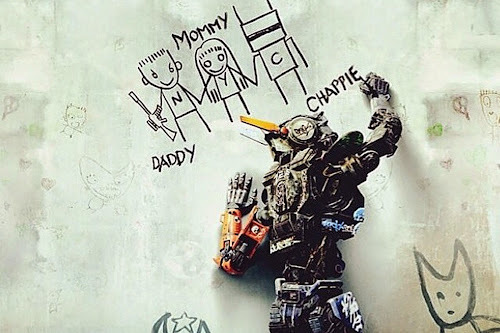 Chappie is raised by a family that, to our eyes, is not good for him. Criminals, wannabe gangsters that try to make him comply to their way of life. 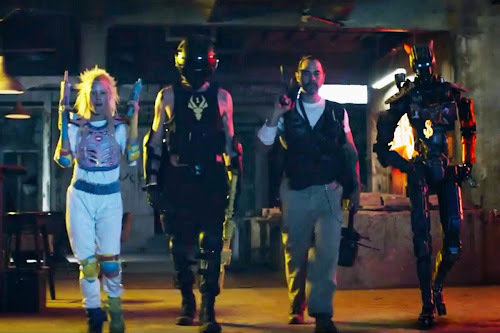 As played by Ninja and Yo-Landi Visser, in roles that cling closely to their own outsize characters as rap-rave stars, they are a parody of the dysfunctional family. The mother figure loves Chappie unconditionally, but stands aside when daddy wants him to hang tough and be a man. The zef life has its own built-in tragedy, and Ninja's ganster poses and twisted idea of what makes someone cool seem destined to lead Chappie down a dark path. When brought into conflict with the rules that Chappie's maker has instilled in him, the tension becomes greater still, and it's telling that neither side ever really ask the most important question of all: what Chappie wants. And there's the thing. Chappie is a non-human intellegence that, from the moment he comes to be, is given a conflicting set of expectations, boundaries and rules. I view the early parts of Chappie's life cycle as that intellegence imprinting on the way he should act given the available information. Sure, he acts like a gangster once Ninja gets his mitts on him. But when Chappie is “born”, he is given the clues that he should act like a child. Deon explicitly says this on more than one occasion: Chappie is a child. How else is he supposed to act? These moments are portrayed by Sharlto Copley's smart and subtle mo-cap performance with grace and charm, adding dignity to moments that could be played exclusively for laughs. What we see in the sequences of Chappie's early days with the Vissers is an exploration of non-human intellegence making sense of its surroundings, and learning at an exponential rate. Chappie is by no means a perfect film: I'd question why Chappie's battery can't be recharged, as Deon finds it easy to slip in and out of his workplace with a van full of robot parts at will. 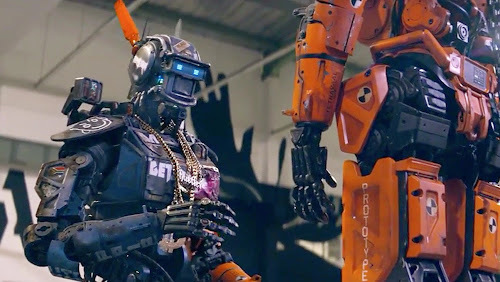 I'm also disappointed that Blomkamp didn't take the opportunity to put the Chappie concsiousness into every Scout that the villainous Vincent disabled. The notion of a peaceful robot uprising, something akin to the one good moment at the end of Alex Proyas' I, Robot, could have been something to see. Nevertheless, I'm still finding ideas and questions every time I think about the film, and I'd like to think that it's one of those movies that will grow and find its audience. I expected smart, funny and action-packed SF from this third Blomkamp movie. I really wasn't expecting anything quite this thought-provoking. You know who agrees with me? William Gibson. Chappie's giving me that thing where I like it progressively more in retrospect. A second viewing is definitely in order. I think if the father of cyberpunk thinks Chappie is worthy of attention, then maybe we should ignore the trailers and sneering commentary, and give it a go.